Humanity is inching closer to establishing colonies on other worlds. Is it really feasible? The best guess is that humanity will set up shop on the moon or Mars or both sometime in the 2030s. NASA says it will develop the ability to establish a lunar colony within six years, but currently has no such plans. Russia says it will establish a lunar outpost by 2030, and China’s and Europe’s space agencies are toying with a moon base, too. Setting up a colony on Mars would be far more challenging. The tiny Dutch company Mars One claims it will send pioneers by 2032—but few outside experts think this is feasible. Elon Musk’s SpaceX plans to land two unmanned cargo ships on Mars in 2022. Four more will follow in 2024—two of those manned. 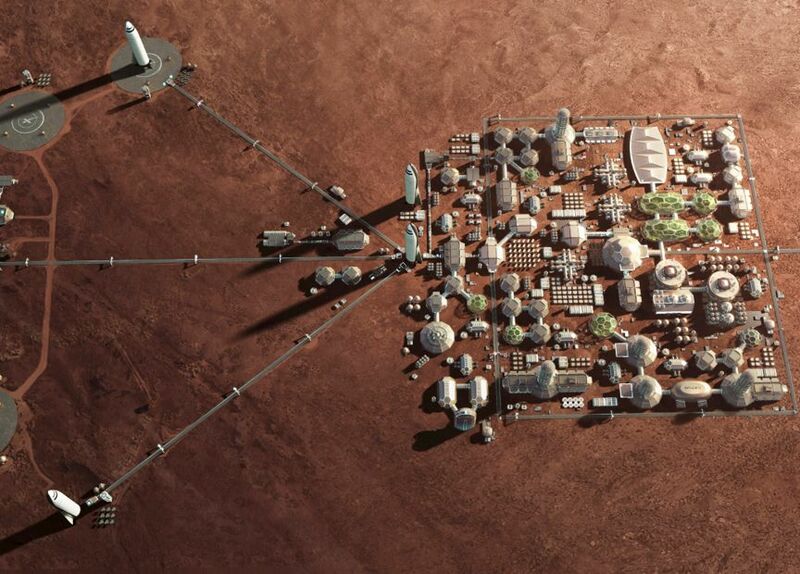 Musk said he wants Mars Base Alpha done by 2028 for the first colonists. NASA’s timeline calls for a round-trip manned mission to orbit Mars in 2033 and for a landing in 2039. But it has no current plans to establish a permanent colony there. In theory. Mars has plenty of water, but it is concentrated in polar ice caps, atmospheric vapor, briny soil moisture, and subterranean lakes. The challenge is accessing it—and making it potable. The same with oxygen. Mars’ thin atmosphere consists mostly of carbon dioxide, and scientists have designed machines that can strip the oxygen atoms from CO2 to make enough oxygen to supply astronauts or colonizers. Food could be grown under artificial light from genetically modified plants. We’ll also need human-friendly habitats. NASA hired the American company Made in Space to develop microgravity 3-D printers that could build some of what we’d need from local resources. MIT researchers are now designing prototypes of habitats inside golf ball–shaped domes. A lot. NASA estimates it could pull off its lunar station for $10 billion, or roughly the cost of an aircraft carrier. As for Mars, any figure is purely hypothetical, since the necessary technology doesn’t exist. “Right now,” Musk conceded, “you cannot go to Mars for infinite money.” That said, one holy grail for reducing the cost of space travel and colonization is reusable rockets, and SpaceX has made great strides on that front. In 2017, it successfully brought in the first refurbished, pre-used rocket component on a launch.